A day observed throughout the South, Juneteenth is celebrated this year on Wednesday, June 19, 2019. The day helps celebrates the final abolition of slavery in the US on June 19, 1865. A Juneteenth celebration in Austin, Texas 1900. But why June 19, 1865? - Wasn't the Emancipation Proclamation signed on January 1, 1863? While the Emancipation Proclamation was enacted in 1863, the state of Texas was slow to recognize the rights of former slaves. And, incredibly, it took more than two years before federal troops finally marched into Texas to enforce the law of the land. The date was June 19, 1865. And it marked the end of slavery in the United States ... completely and forevermore. The very first Juneteenth celebration took place the following year -- and every year afterward -- both in Texas and in other states throughout the South. But why Juneteenth? In the popular vernacular, June 19th was simply shortened to Juneteenth. How do people celebrate Juneteenth? Today, ways to celebrate might range from modern jazz concerts and museum exhibits to church services, neighborhood block parties, and parades. lone star rising over a new horizon. • In 2017, the TV comedy hit "Black-ish" featured musician Aloe Blacc (who played himself) who was enlisted to write a Juneteenth song to helped popularize the holiday. • Although "Lift Every Voice and Sing" is the official anthem of Juneteenth, other popular songs appearing on Juneteenth music playlists include Billy Holiday's "God Bless The Child", Sam Cooke's "A Change Is Gonna Come," and The Staple Singers' "Freedom Highway". • Today, 42 states recognize Juneteenth as a state holiday or day of observance. • Juneteenth flag raisings have also become a popular way to mark the day. It's been a tradition since 1997, with the creation of a flag that depicts the lone star of Texas rising over a new horizon. Of course, a Juneteenth flag raising ceremony wouldn't be complete without a reading of the Emancipation Proclamation, and the playing of the national anthem. 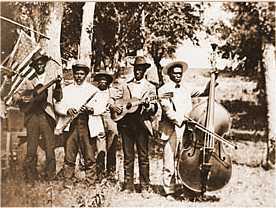 Juneteenth.com - Check out an extensive collection of historical facts and trivia, plus where to find Juneteenth celebrations taking place across the US and worldwide. Juneteenth Recipes - Multicultural Cooking Network - Get your fill of instructions and ingredients for making homemade Southern fried chicken, barbecue favorites, and red-white-and-blue desserts. Juneteenth at Enchanted Learning - For the kids, here's a great teaching resource featuring downloadable word hunts, grammar, and spelling worksheets.